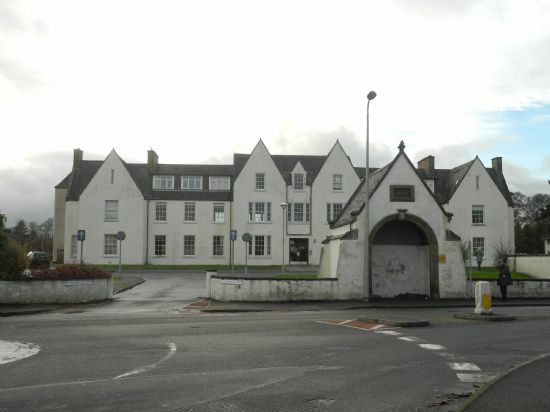 This building was built as a poorhouse at Hilton, Inverness between 1859 and 1861 at a cost of c. £6,000. 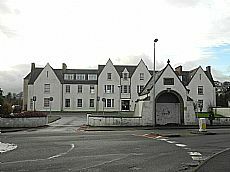 It was used to rehouse ‘inmates’ from the overcrowded Dunbar’s Hospital in Inverness, with accommodation for around 170 people. Known as Inverness Poorhouse between 1859 and 1921, it then became Muirfield Institution 1921-1961 and then Hilton Hospital 1961-1987. After it closed, it was converted to flats. It is now known as Old Edinburgh Court. The main building is an H-shaped layout, and there are single storey buildings in the back. Men and women would have been segregated into different wings. A date plate in the gatehouse reads 1860. The single storey buildings in the back were used within living memory by residents who cut wood into bundles for firewood. Documents in the Highland Archives include Minutes 1861-1910, Financial Records 1904-1955, Correspondence 1927-1951, Registers 1861-1991, Patient records and case files c. 1924-c. 1961, Report Books 191-1979, Misc patient records 1899-1947, Registers of official visitors 1928-1970, Property & Equipment 1928-1970, photographs c. 1980s, and misc material from 1963-1975. Information about staff and residents can also be found in the yearly census from 1861. (Only records over 100 years old are available for inspection.) These show that from the earliest times the poorhouse contained children as well as adults. Prior to 1845, the poor of the parish were looked after by the church. After this time parochial boards took on the responsibility. In larger communities like Inverness poorhouses were built. The first purpose built poorhouse in the Highlands was built in Tain in 1850. Highland Archives currently (January 2014) have an exhibition on poorhouses in the Highlands. This site was one of a number looked at in an ARCH course investigating the heritage of the Hilton area in Inverness held in Autumn 2013.